Today Alison from Little Bunny Quilts is sharing a cute mug rug made using Cherry Guidry's Kitchen Love collection. If you haven't seen these prints, you'll love them! Alison drew inspiration from the fabric and her kitchen, even using a common utensil as her applique template. Have fun with this mug rug, and then head over to Alison's blog to enter for a chance to win a bundle of Kitchen Love! Hello! I'm Alison from Little Bunny Quilts, and I am happy to be back here at Sew In Love With Fabric sharing a quick and easy tutorial for a mug rug today! I decided to use the Kitchen Love line, because I love to cook and bake. The prints are just darling in this collection! 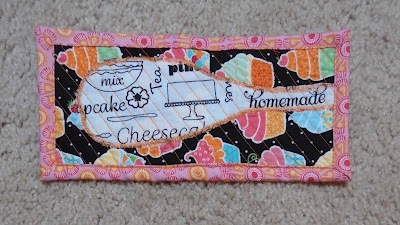 And as a little twist, this mug rug could also be used as a washable spoon rest! Using your favorite kitchen utensil, lay on your fusible web and trace. I used a wooden spoon. Iron your fusible web template to your chosen fabric and trim to the correct shape. Cut a rectangle for the front 4" x 8", cut a backing rectangle 5" x 9". Remove the backing paper from the fusible web and iron onto your 4" x 8" rectangle. Use a satin stitch to sew around the edges of your utensil. I used orange! Layer your backing rectangle, a batting scrap (mine was 4.5" x 8.5") and quilt as desired. I did diagonal lines across my piece. Trim your mug rug and bind as desired. I cut my binding strips at 2.25" wide. Enjoy your new spoon rest/mug rug! Perfect with a muffin and a mug too! Head over to Alison's blog to be entered for a chance to win a fat quarter bundle of Kitchen Love. Cute, and a great idea to use a utensil for the template! 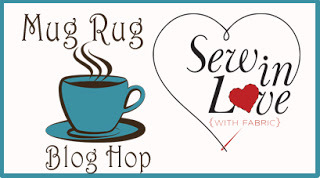 I've enjoyed each day of this Mug Rug Blog Hop. Thanks so much for sponsoring it. I love Alison's mugrug/spoon rest! I think I would put mine by the microwave. For catching those nasty drips from the "stir halfway through heating" mess makers. I love this idea to make a kitchen tool/spoon rest rug. Great idea. Thanks. Cute idea, I'm glad you shared this one. Thanks for a lovely little hop! Nice idea. Have enjoyed the hop. Thanks.